The Ministry of Defense has refused to comment and is unable to confirm the information at the time of writing this article. Photo: Russian Su-34 bombers. 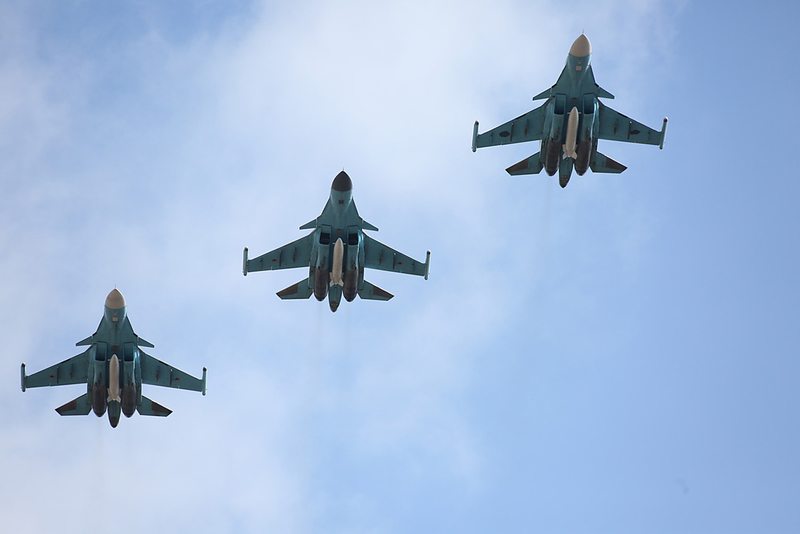 Russia strengthens military operations in response to U.S. reversal to 'Plan B' in Syria. The Russian Ministry of Defense has transferred additional Su-24 and Su-34 tactical bombers to Kheimim, its airbase in Syria, according to the Izvestia newspaper (in Russian), citing an unnamed source in the military. Izvestia reports that Su-25 attack bombers will also be deployed in response to the U.S. announcement that it will turn to 'Plan B' in Syria. The U.S. plans to increase the number of combat missions to Syria, transfer special forces to the region, and will start new arms deliveries to the moderate opposition. "If necessary, Russian Aerospace Forces (VKS) will have to strengthen its command within the next 2-3 days. The Su-25 attack bombers have been designated for transfer to Khmeimim Air Base, the troops have already been selected and are prepared for deployment; the crews are on standby, waiting for command," Izvestia's source reports. The Ministry of Defense has refused to comment and is unable to confirm this information at the time of writing this article. In November 2016, the Russian Navy's flagship will be sent to Syria’s shores: the aircraft carrier 'Admiral Kuznetsov', with Su-33, MiG-29K/KUB fighter planes and Ka-52K 'Katran' helicopters on board. As RBTH’s source in the defense industry reported, naval aviation may be able to deploy the new X-38 missiles in combat by the end of this year. The air-to-surface missile has a range of up to 25 miles. It is designed to destroy armored vehicles and fortifications as well as enemy ships and submarines.